It was a trip of Note....THe Makgadikgadi salt pans never disappoint. Starting from my good friends camp 'Meno a Kwena' we travelled south for about 100 km and stopped at an ancient village site, the site has produced some quite rare artifacts, on this stop we only found pottery fragment, but from 2 periods. from here we proceeded north east up into the cattle post areas east of Rakops. Today I'm back out in the great Okavango Delta with Thembi, Morula & Tabu, the 3 elephants I was looking after back in Jan this year. All 3 remember me and Thembi even gave me a wave a dance then through a mopane brance at me once again, I'm happy her aim hasn't improved over the months and she missed again... as they departed to the west of camp a herd of buffalo was to the South of camp. in the afternoon I had a chance to catch up with Amos and Leano before they departed with the trio. Two is busy being a carpenter and is making a chair, it looks a bit shaky to me but he insisted it will be strong when its finished. Greetings from an action packed delta. No sooner had the trio returned yesterday evening then the rain started again, in my tent it was difficult to hear anything other than the rain and the odd tree branch coming down, I did hear lion once again close to camp but this time to the south, then hippo to the North in between the thunder. it was about 9:30 when the impala started barking and then some more rain. The next morning some new tracks were on the road to the boma.. lion, a female and her cub about a year old had killed an impala just off the road, and then moved next to the container and slept, they even drank rainwater from the trio's water troff. Leano & Dazo said that they had seen the lions from there tents. The trio departed to the east across the water this morning, an hour later we herd hippo mating in the same direction, it sounds just like a buffalo being killed, but goes on for much longer. The trio returned a little early from there mornings adventure and hot on there tails was a tremendous storm, it hit camp just before 2, high winds and more crashing branches. by 4 we had blue sky and sunshine! Marula's head is much the same today and the zinc/oil mutti is sticking well. our afternoon went as normal after the mornings excitement. Marula's head is the same as yesterday and we are checking her twice a day but medicating once. Tabu's foot is still being treated as are 1 or 2 scrapes on his front legs, his trunk is better now. The trio departed as the storm clouds once again build up to the East. After 7 there was a plane on the airstrip it seamed to take off then return to the strip then take off again! We're not sure what was going on there? 7:30 ish the storm was now to the North and East, between the thunder I could hear wild elephants just across the water trumpeting and lions as well, this went on for 15 - 20 min. We had some light rain but once again the heavy rain missed the camp. The trio returned with Amos & Dazo just before 8, the wind was blowing, leaves flying, but still very little rain. It was about 1 am I woke and herd a crash, then crying, the cry's were very close, just out of the camp to the North West I think. The cry's became muffled and weak... I was witnessing a kill. I think it mush have been the leopard as there was no noise afterwards, then the hyena's came running through the camp whooping loudly, they too had heard the crying. There weren't any alarm calls from impala so I am guessing that it was one of the bush bucks that came to an end. this morning I took a look around that side of the camp, but didn't find anything conclusive other than the hyena tracks, it was too wet to venture far. Earlier this morning we had some cloud cover as the boma was cleaned out early and the mopane lads got away at 6:40 Leano & Dazo with the trio just after 7, its very hot & humid with more storm clouds building to the North & East... The thunder is starting now. As the storm clouds gathered to the East we got some cool air at last but no rain, the trio returned from their mornings adventure, with a fresh mud coat they settled into the boma,. In the afternoon in was noticed that Marula has 3 or 4 more small (30mm) soft lumps on her head, she is agitated when they are touched, as the skin isn't broken we didn't apply any medication, her other 3 lesions are healing well. Tabu's foot is still about the same., the trio then departed to the south for the evening adventure, returning just before 8. As we got to camp, he ran to collect his gear and we had to tell him to slow down, the flight is 13:10... we all laughed. We got to the airstrip in good time and Amos was surly in Maun before we got back to camp. The trio then returned and settled into the boma, lunch was served (ok I cooked and served myself). Yes indeed yesterday was a hot one, the trio returned fresh from the mud-bath, while Leano, Amos & Dazo looked hot & tired. the second expedition of the day followed the medications and an extended hose session, Jabu was partially thirsty. they departed to the South. Meanwhile back at camp the office tent was drying out after the mornings wash. rain clouds are starting to form in the distance to the East. All was quiet as the day closed, the trio returned about 7:40 it had been a long hot day. All is quiet deep in the Delta, although we did have some excitement yesterday. while the trio were still out on morning maneuvers, two & Sunny had just finished the small tent path & I was just relaxing with a cup of 'mens tea' the local banded mongoose arrived 10 or 12 of them. However 1 spotted me and the group changed direction. All was quiet, then I was checking some camera items in the container and moving back & forth to the kitchen when I saw a Mozambique spitting cobra, it hissed and made hast into the kitchen, I ran to the side of the kitchen trying to see were it went... but it had vanished. Sitting sill at the table finishing my tea I was hoping to see the snake leave as I couldn't see any exit track. About 45 min had passed and no sign of the snake I felt sure was still at large. I checked under the sink, the fire starter box, gas bottles, nothing. It was at this point I decided to ask Two & Moks for some help, the hunt was on, they checked all the places I had and the only place left was under the freezer, two lifted 1 side while I looked under (from a way back) and yes the serpent was coiled at one end. the freezer was turned off and some petrol thrown at the snake but didn't move, by now Moks was standing on a table armed with two mopane clubs and I felt pity for the cobra. it was given a prod with a tent pole and it made an attempt to escape but meet with a blow to the neck from Two, then a second just to make sure, it was dead. Two carried it off on the stick scared to touch it yet proud to have hunted the beast. Peace resumed in the camp, and I cooked up the wild mushrooms the Amos had brought me yesterday, a sort of egg, mushroom & cheese omelet, very nice. The trio returned non the wiser of the mornings excitements. The trio's second expedition of the day was a little late off the mark, however they had a good hose down and seamed in good spirits. The moon was bright last night and all was quiet through the night. We had a pink Champagne sunrise this morning, not a cloud in the sky. The trio departed expecting a hot day. Two and Sunny are going to clean the next tent and Moks can do some laundry. its going to be a hot one. Deep in the delta all thinks are going well, the education area is now finished, and was inspected by the impala herd almost as soon as the guys had left. The trio are all doing well, they all had a good hose down after lunch as the mornings cloud had gone and it became quite hot, the various medications went without a problem and they departed with thunder clouds way off to the east. We had yet another awesome sunset I took some photographs on the floodplain in front of camp, as I was returning to the kitchen area wild a elephant passed on the road and headed towards the water, he was in quiet a hurry and was probably one that had been chased recently. The night was quiet with some distant lion roars way off towards the airstrip. during the night they came closer at one point, hyena tracks were in the camp this morning but nothing in the camera trap. The trio departed this morning across the water, while Moks, Two & Sunny made a start on the next tent were the fire wood is stored. Deep in the Okavango. Delta all is going well, Leano collected his monthly rations, the trio are all doing fine and departed for there afternoon in the bush as normal. The mopane lads returned to camp at about 5 and reported to have seen a large herd of buffalo near to were they were cutting. it was a very quiet night, only a distant hyena far off to the South as eyes closed. This morning we woke to a cloudy sky, some gusty wind, it was really quite cool, the trio departed without any fuss, weekly rations are ready for collection and the children's education area will be finished today. The wind has dropped and the cloud is burning off, good for solar power. The mopane lads departed this morning in good sprits, Moks & I cleaned the boma, Leano & Amos also helped, while keeping an eye on the trio before they departed. Looking after Grey Matters camp deep in the delta, petrol is diesel ! greetings from a sunny delta. We've now into what looks to be our second full day without rain, and our solar power system has recovered. Yesterday the trio went about there afternoon as normal, medications applied and off into the bush in a westerly direction. returning just before 8 and all was well. Sunny pumped water, and I gave the batteries an extra boost with the generator, at this point we decided to check all our fuel supplies, and lucky that we did... we have 5l in the water pump, 25l in the generator, just over 1/4 tank in the 3F and 30l petrol in the 200l drum. we discovered that the new 175l drum is diesel not petrol! we are fortunate to find this error now. We have enough petrol to last 5 weeks so this can be addressed once Doug is back in Maun. A quiet night with just a lion call far off to the North, although the hyena track were on the road this morning as normal. Today the trio departed towards the East, Moks is cutting grass at the laundry while Two is working in the education area, which is starting to look quite smart. Sunny is going to empty the remaining 30l petrol should we have a means to get the empty drum to Maun. looking after Grey Matters camp deep in the delta, a quiet day. We had a quiet end to our day yesterday, no emergencies, no rain, no worries, ahuna mattar.. Marula's lesion is getting better, Tabu's foot no worse the trio had a good evening. During the night lions were calling to the North far off then not so far then a wild elephant trumpet in the same direction then lots of baboon chatter..... The leopard camp through camp I heard him first to the South then to the North.. nothing on the camera trap, though while I was checking the trio this morning the bush buck passed the camera trap..
On there mornings outing Thembi was not to be outdone by the wild elephants and sounded off while in pursuit of a baby warthog..! The Batteries are slowly coming back to normal power, and progress is showing over at the children's education area. looking after Grey Matters camp deep in the delta, from one extreme to another. 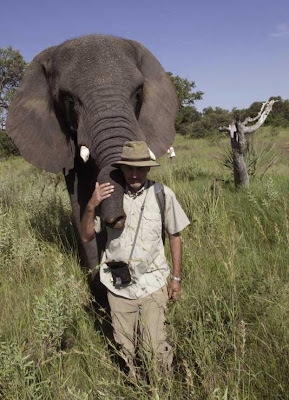 Two visits in one day, the second were Jean & Francis from Baines Lodge, that had come to ask in we new about the clients coming to meet the Elephants tomorrow? Of which we didn’t! Anyway a quick email to Doug & Sandi should fix this one. We all shared some water melon the I had kept in the freezer.. Ice cold and refreshing! Before the trio departed on there afternoon forage, the medications were administered all was going well, they all returned safely moments before eight. All tucked up I had a chat with Leano, Dazo & Amos about the possibility of having the clients meet up with the trio, by now I had received the booking from Baines Lodge and forwarded it on. During the night our power system failed, I cut up extra goodies for the trio should our meeting take place, butternut, apple, sweet corn and onion went into the mix, and way the clients didn’t come, that’s when the radio stopped working as it hadn’t charged through the night. But the trio had some great treats. 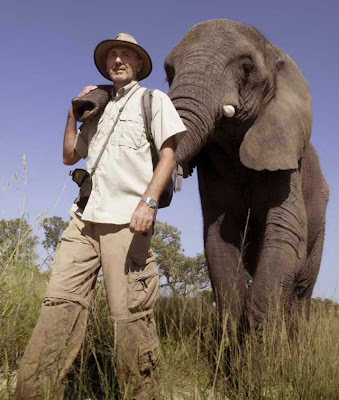 I managed to get Doug on the sat phone and all was explained, the booking had not reached him and we ran out of time as the clients left after lunch, they did however see the elephants the day before, I found out later. The power is a solar powered 24V arrangement consisting of 8 batteries with an inverter and a generator for back-up, some of the battery links were lose and this compromised the system, I have re-linked all the batteries and Sunny has made stays to keep the tent window open for better cooling of the inverter etc. Bead & peanut butter for lunch and its already 3pm. In the Delta, we've had a quiet day and night, the trio returned fro their morning in the bush with Leano, Amos & Dazo, the boma is looking good with all the holes filled and the drainage trenches cleaned out. Around midday I came across the impala herd, they were in camp around the shower area, I stood very still and they came within 10M. plucking leaves as they slowly moved off, A most magical moment. At some point during the day some ropes broke on the tarpaulins over the container, two of the three had come down, these were fixed in the afternoon, with string from the used bails. The trio returned just before 8 and all was quiet through the night. During the night the three toed hyena had walked the road from the boma to the camp, his tracks were clear in the mud on the road, Amos told me, he was the one that often visits, he is responsible for missing boots and has tried to carry off the guys food store trunk on more than one occasion. The trio departed this morning with Dazo, Amos & Leano towards the East. Moks has some laundry to do while Sunny and Two have started work on the children's camp area, this will take a few days I think as its quite overgrown now. The trio returned from a rather damp outing in the morning. Amos came over to camp as he & Leano had found some banded mongoose pups near the elephant dung pile. We went to investigate, it was the high pitched squealing that had caught their attention, 6 or 8 pups were well hidden at the base of acacia bush, we only managed to see two of them, they were very small, one still with its eyes closed 2 or 3 weeks I think. 4 pm and another downpour. if it were 6 deg instead of 26 I would think I was back in the UK ! Marula's lesions seam better, although she still shows discomfort while her medication is being applied, but there is much less puss now. Tabu's meds are still going without fuss, he is still showing much interest in the container, those bails must smell really good. Thembi enjoyed the mushrooms that Sunny collected. the trio depart for the bush once more. From 4 till 5 I ran the generator to top up the batteries. The mopane lads arrived just before 6 they are all very tired, but they did well, the road was very wet from the previous nights torrential rain. they did get stuck once and had to release the trailer in order to get free. The trio returned to the boma and we all slept well, no rain last night, I could hear lion to the North, hippo to the West and Hyena quite close to the East as my eyes closed. The sun rise was good to see this morning, the first we could see for some days. We are all happy to see a break in the rain. The trio departed to the East this morning and after the boma was cleaned out Sunny is going to grease the tractor while Two and Moks make good the boma trenches once more, the rest of this morning they can clean up there tents, mess area and make any repairs necessary. Tent cleaning is on hold due to the weather. At some point today Sunny & I will go to Stanley's Camp to get fuel for the tractor and I'll try and get some doom spray as I've found quite a number ants coming out of my MacBook today ! Not sure what they are trying to do in there, but I'm sure its nothing good. 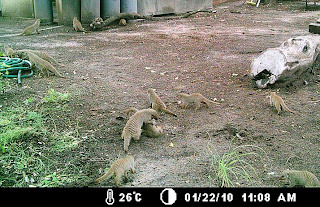 I've just checked the camera trap and found the banded mongoose group in the camp, most likely the parents to the pups Leano & Amos found. As the trio returned from there morning outing, much interest was shown in the direction of the container ! before the afternoon foraging expedition, the medications were administered, Marula's lasted lesion was cleaned and the treatments applied, she was not enjoying this, although once done she seamed quite happy (there was less puss than yesterday). Tabu made no fuss while his meds were applied. all three showed more interest in the top of the container on there way out. After cleaning the boma, two and I used the landcruiser to pull the tractor step straight as it was getting close to the tire. Sunny came with me for a short excursion round to the water pump and towards the hippo pool, to see if we could see any leopard tracks, our exploration was temporally halted in some ruts..! we put some logs under the wheels and retreated back to camp, picking up some wild mushrooms for the trio on the way. The storm of all storms so far hit around 1 this morning, the ground shook as lightning camp down in the camp, this went on for about 30 min although it seamed like hours. the thunder was loudest I've heard, I was hesitant to switch on the power this morning! The rain continued until nearly 7 am, around 70 - 80 mm I would guess. The mopane lads doned their rain gear and departed down a flooded road. The boma trenches are draining well, although 1 edge of Thembe's area still held some water. The mopane lads, Amos & Leano helped with the boma before departing with the trio, Moks & I finnish up the boma, I left him to put out the mopane while I got the weekly rations ready. Yesterday we did clean out the tent as planned and had a small group of banded mongoose visit the fire area, I had set up the camera trap there and they were my first wild subjects! The trio departed after a quick hose down, Marula has a third lesion on her head now, I think she has some skin irritation and is rubbing against trees. Yesterday evening we had a herd of impala in the boma, then after the trio returned the impala returned to the outer boma for the night, I could hear hippo to the North but no lion last night. I herd the leopard again during the night which would explain why the impala are hanging around the boma. This morning the trio departed towards the airstrip under a cloudy sky, very humid. we cleaned out the boma and awaited the trucks arrival, the truck arrived about 10 am with Dazo on board and 101 bails of elephant feed, all were unloaded in around 45 min, just in time as rain started, we pulled over the tarpaulins and unloaded the petrol. not so much rain as to seriously wet the bails luckily. 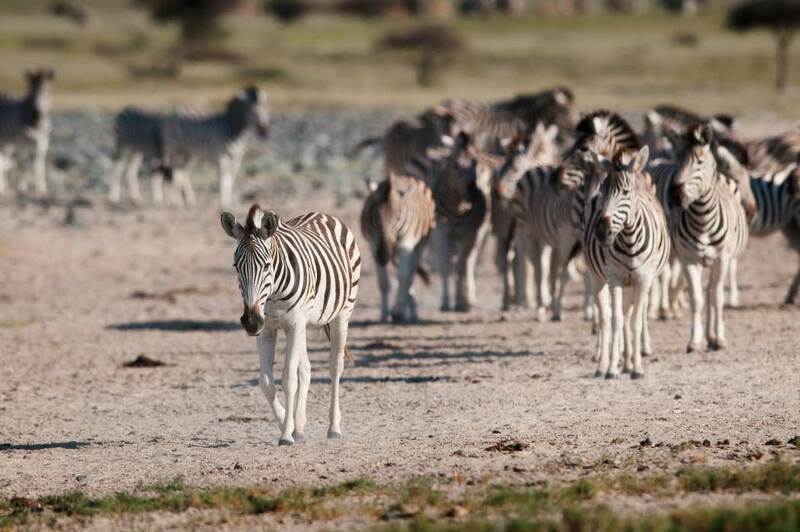 The driver and his mate rested for about a half an hour then set off on their return journey to Maun. Out here, deep in the delta, all is going well, Sunny finished welding the wheelbarrow wheel while Two & Moks working on the container, the trio returned after 2 to find the container all cleaned on the inside.... Bit of a communication error... they settled down in the boma while Amos & Leano had lunch and took a break. In the afternoon, I setup a YouTube account and put up a short clip of the red lechwee fight, its on http://www.youtube.com/watch?v=VSmIAv9_6yg Moks, Sunny & Two worked on the top of the container so we are ready for the truck tomorrow. Meanwhile back in the delta.. light rain continued most of the morning, the boma now has better drainage ditches, and just before 2 the sky once again opened with lightning, thunder with rain to test the new drainage, at this point the trio came in at a quickened pace, Amos & Leano riding atop as the rain fell harder. they seamed happy to be back home in the boma. the rain became lighter within an hour, but by 4 a steady downpour ensued once more this time without thunder & lightning. Marula was calm and her medication went without fuss as did Jabu's. the trio departed a little late due to the rain (10min) to return just before 8. Sunny didn't manage to finish all the wheelbarrows yesterday, as the last one needs some welding which is almost impossible in rain we had most of the day. This morning the sky is still cloudy but clearing we hope, the trio departed on time as lions and baboon made noise just to the north and quite close, Sunny can finish the wheelbarrow this morning and continue with the tractor key switch puncture etc while Two and Moks are making the container ready for the trucks arrival on thursday as its not raining this morning! Leano and I assed the mopane situation and have scheduled the next collection for Friday. We arrived back at camp about 2.15 and the trio were in the Boma feeding, the small tent was drying nicely, I hand a chat with Amos about working extra days, his medication and the message about his wife and the monies being sent. After lunch emails were checked and the freight stored. Sunny was happy to get the sieve, oils and key switch for the tractor, we then pumped water. Lion were calling to the North, hippo to the South, thunder rumbled in most directions as I slept, I woke around 1 as lightning crashed down in camp and the wind was driving the rain horizontal I had to close down the tent window as the rain was coming in the tent from all directions! this when on for about an hour. didn't or couldn't hear any complaints from the trio. When we finished cleaning the boma I asked Two and Moks to clean the boma drainage trenches as some sand had washed into them in the rainstorm. and then asked sunny to service all the wheelbarrows this morning and fit the tractor key-switch, the MF tractor also has a slow puncher( front left) that requires attention. it is too damp to clean tents this morning! I've just cleaned up the kitchen all the chairs are wet from the rain and had to change the gas bottle for the fridge, it did seam rather quiet first thing this morning? the cloud cover developed into thunder and lightning after 4 this seamed to affect Marula as it took 45 min or so to administer her medication (it was also very windy) she was not happy lying down so in the end her wound was dressed with her standing next to the tractor, Consequently the trio departed around 5. (Jabu was fine with his meds) they returned just before 8. We had tremendous thunder and lightning last night, but with just a few drops of rain, lions were very active to the north and a leopard went through camp. wild elephants approached the boma but didn't make a problem. The trio departed this morning as normal. We still havn't managed to contact Amos's wife yet and will keep trying, he says his finger is slowly improving and is keeping it splinted. The trio came in just before 8 last night and all was well, after settling in the boma we tried to call Amos's wife but there was no answer. This morning all went as to plan, the boma was cleaned and the mopane lads were on their way just after 7 and the trio shortly afterwards. We did try to call Amos's wife again but still no answer, he is a little concerned but we are putting this down to the Zim telephone system for now. Amos is also concerned about his finger, I suggested that he keep it high as much as possible to relive the throbbing, he dose have it strapped which is good. We have some good cloud cover at the moment, the lions are still very vocal even till 7 this morning, and seam to be moving to the North East, hippo and hyena to the South East. Baboons are making some noise beyond the boma so I will check that side from time to time today as the mopane lads are out. we have had a quiet afternoon in camp. Elephants came out of the boma one by one Marula, Tembi then Tabu, each hosed for some time as it is quite hot now Marua's head and Tabu's foot received medication and they are now out for the afternoon. the batteries are testing 25.1 volts and I'm just off to finnish putting my tent back together from the mornings washing & cleaning.